In the coming homeschool year we will be memorizing the Ten Commandments. Just as with Ephesians 6 (our last big Bible memorization), I have created a copywork download for you! This download is the King James Version of Exodus 20: 1-17. 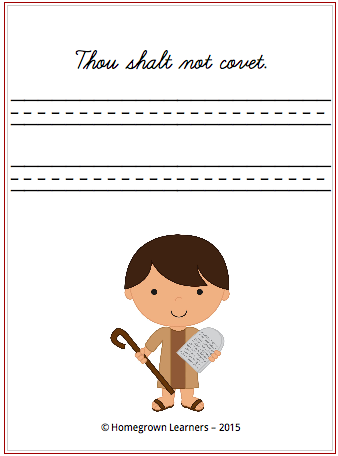 It includes printables posters of the full text, as well as individual copywork pages of each of the 10 Commandments. You have the option of a print version, or a cursive version. We will be using this in Classical Conversations, Cycle 1, or it can simply be used to help your child memorize the 10 Commandments. What a BEAUTIFUL gift to give your children -- hiding God's word in their young hearts. Please click the images below to download your FREE copywork! Enjoy!